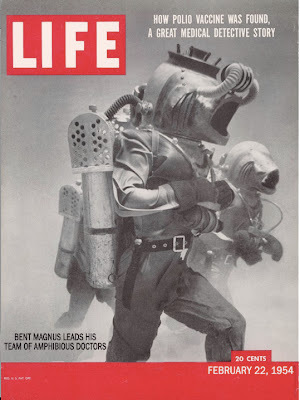 As expected, the LIFE exposé pays disgustingly little attention to what my team set out to accomplish on the floor of the Atlantic Ocean back in '51. Yes, our expedition on the Blake Plateau was crucial to the discovery of the Polio vaccine, and yes, I'm happy to have played a major part in Salk's historical achievement. But to dismiss the true nature of our mission as "peculiar" and "crazily insane" just shows how little they understand ancient shark burial grounds and the promise they hold for our terrestrial society. Should I have responded differently to that reporter who asked me to elaborate on my theory? I doubt it would've made any difference. It just proves what I've always asserted: journalists will print anything about you if their suits are ripped to shreds by a shark in your shark tank. On a separate note, I look thin in the cover photo. I'll double my ration of filet mignon and butter for the next two weeks.